In April 1939, in line with the rest of the Territorial Army, the London Irish had doubled to two Battalions; a third battalion 70th (Young Soldiers) Battalion was formed in the autumn of 1940 before being disbanded in April 1943. As the LIR was placed on a common footing, at least for reinforcement purposes, with the RUR, a draft of LIR men joined the 1st Royal Ulster Rifles in Rawalpindi in December 1939. 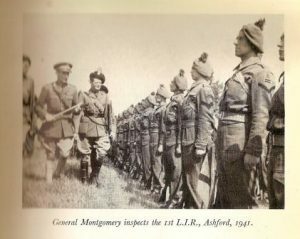 The 1st Battalion (1 LIR) was originally commanded by Lt-Col MacNamara MP, although due to promotion and re-posting, he was not able to lead the battalion into action. At the outset of war, LIR took up defence duties in Kent, being involved in disembarkation duty for the Dunkirk evacuation at Margate and Ramsgate, and in manning anti aircraft small arms in ships in the Channel. Over the next two years, the battalion remained within the Home Forces: one notable action was the capture of a Junkers 88 at Graveney Marsh in September 1940. On 27th August 1942, 1 LIR, now commanded by Lt-Col Good, set sail for the Middle East, joining 168th Brigade as part of the Persia And Iraq (PAI) Force in the prospective defence of the Iraqi oilfields. After a very uncomfortable 6 months in Iraq, 1 LIR moved in April 1943 to Egypt for intensive training and then detached with the rest of 168 Brigade to join the 50th Division’s offensive during July 1943, south of Catania in Sicily with their first major action taking place near to Fosso Bottaceto. As part of the 5th Army, 1 LIR then took part in offensive action at Monte Camino in December 1943, where they suffered heavy casualties. In January 1944, they took part in the Garigliano River crossings and unsuccessful attack on Castelforte, before they were moved at short notice in early February 1944 to defensive positions within the Anzio bridgehead. Over the next six weeks, the Battalion suffered grievous losses as part of the ultimately successful Allied defensive actions. The names of the “Factory” and the “Wadis” became evil reminders of those desperate few weeks. A total of 600 men from 1 LIR were listed as being killed, wounded or missing during their time at Anzio. Following much needed rest and gaining significant levels of reinforcements and undertaking extensive training in Egypt, 1 LIR returned to Italy in July 1944, now forming part of the 8th Army, to take part in September in the battles for the Gothic Line north of Florence. During the winter of 1944/45, the battalion took up defensive duties near to the River Senio, before taking part in April 1945, with 56th (London) Division, in the initial crossings over the River Reno that led to the final capitulation of the German Army in Italy. Sadly, former Commanding Officer, Colonel Macnamara was killed by enemy shelling when visiting the 1st Battalion in December 1944, near to the Senio River. – At the outset of war, the 2nd Battalion (2 LIR), commanded by Sir William Starkey, Bt, and having been reformed in April 1939, spent the first two years in several locations in England and Wales, including St Alban’s, Lowestoft, Malvern, Haverfordwest, Knutsford and Goodwood. They were initially involved in defensive duties in readiness for the expected imminent German invasion of Britain as well as supporting civil defence duties. In January 1942, 2 LIR joined the newly formed 38 (Irish) Brigade along with the 1st Battalion, Royal Irish Fusiliers (1 RIrF) and the 6th Battalion, Royal Inniskilling Fusiliers (6 Innisks), and later in the year all three battalions undertook extensive training in Scotland with the 6th Armoured Brigade in their role as a lorried infantry brigade. 2 LIR, with Lt-Col Jeffreys now in command, sailed from Greenock in early November 1942 to join the 1st Army in their initial, unsuccessful attempt to capture Tunis before German forces could land sufficient strength to protect Rommel’s withdrawal from Egypt and Libya. In January and February 1943, 2 LIR were involved in desperate defensive actions north of Bou Arada with more than half of the battalion being killed, wounded or captured. 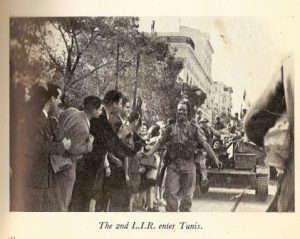 After some rest and after receiving substantial amounts of reinforcement, 2 LIR rejoined the Irish Brigade in April 1943, and took full part in the successful assaults on the high Djebels north of Medjez-el-Bab, which included some desperate fighting at Heidous, and this opened the way for the final advance and capture of Tunis in May 1943, where 250,000 German and Italians were taken prisoner. Lt-Col TPD (Pat) Scott had taken command of 2 LIR in March, and to the London Irish Rifles came the honour of being part of the first infantry formation to enter the city, and the further honour of 130 officers and other ranks marching in the Allied Victory Parade through Tunis on 20th May 1943 in front of Generals Eisenhower, Alexander and Montgomery. Pat Scott handed over command of the Battalion in June 1943 to Lt-Col H Rogers, and in early August 1943, 2 LIR, now part of the 78th (Battleaxe) Division, joined the assaults on the hills west of Mt Etna near to Centuripe and in a short sharp campaign proved the worth of their excellent battalion spirit. Following a period of rest on the north coast of Sicily, the 2nd Battalion then landed at Taranto in September, and joined the 8th Army’s advance up the Adriatic coast. During the next two months, 2 LIR saw significant battle action at Termoli, and at the Trigno and Sangro rivers, before advancing north to the River Moro. Following a transfer to the very snowy central Appenine mountain region of Italy, near to Castel Di Sangro, where they spent the New Year, 2 LIR was moved in February 1944 to the Cassino front. For two months, they took part in defensive duties near the Gari river and on top of Monte Castellone, part of the Cassino massif. They then formed a key element of the Allied breakthrough into the Liri Valley during May 1944 at Sinagoga. Advancing north of Rome, 2 LIR, now commanded by Lt-Col Coldwell-Horsfalll, who had succeeded Lt-Col I.Goff when he was killed at Cassino, again met significant German defensive positions near to Lake Trasimene, before the Irish Brigade led a decisive breakthrough of the Albert Line, allowing steady 8th Army advances towards Florence. After being taken out of the line in early July 1944, and resting in Alexandria for two months, 2 LIR returned to offensive action in October 1944 as part of the 5th Army, north of Florence at Monte Spaduro, before spending a difficult, static winter and early spring period near to the River Senio. April 1945 saw the battalion fight for the first time in the same battle front as 1 LIR and they joined the mobile ‘Kangaroo Army’ in the breakthrough of the Argenta Gap that directly led to final German defeat in Italy. For the last 10 months of the campaign, 2 LIR was commanded by Lt-Col HEN ‘Bala’ Bredin, DSO (with bar) MC (with bar), a RUR officer, who had previously served as second in command of 1 RIrF and when commanding 6 Innisks had been badly wounded near to Cassino in May 1944.
had over 700 men killed in action. were awarded 6 DSOs, 44 MCs (2 with bars), 14 DCMs, 55 MMs, 2 George Medals, 2 American Silver Stars, and 2 American Bronze Stars. 111 other men were mentioned in despatches.